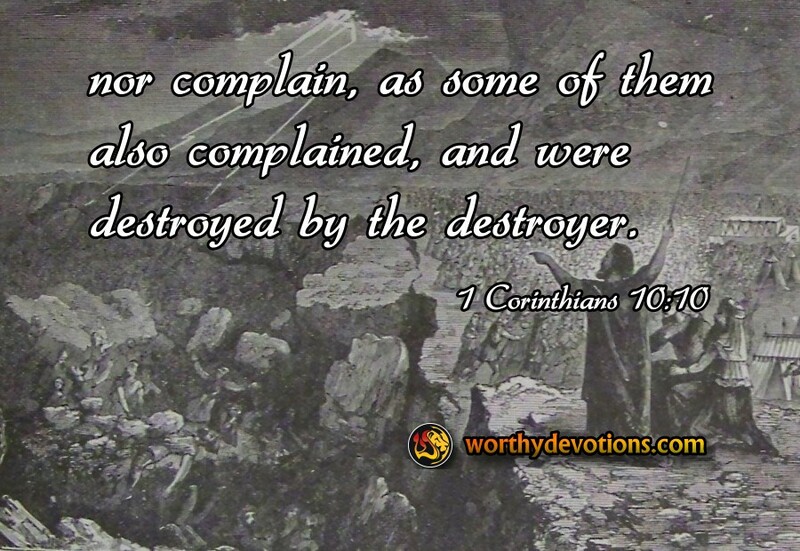 1 Corinthians 10:10 nor complain, as some of them also complained, and were destroyed by the destroyer. Numbers 14:36-38 Now the men whom Moses sent to spy out the land, who returned and made all the congregation complain against him by bringing a bad report of the land, those very men who brought the evil report about the land, died by the plague before the Lord. But Joshua the son of Nun and Caleb the son of Jephunneh remained alive, of the men who went to spy out the land. Numbers 16:3 They gathered together against Moses and Aaron, and said to them, "You take too much upon yourselves, for all the congregation is holy, every one of them, and the Lord is among them. Why then do you exalt yourselves above the assembly of the Lord?" Numbers 16:30-32 But if the Lord creates a new thing, and the earth opens its mouth and swallows them up with all that belongs to them, and they go down alive into the pit, then you will understand that these men have rejected the Lord." Now it came to pass, as he finished speaking all these words, that the ground split apart under them, and the earth opened its mouth and swallowed them up, with their households and all the men with Korah, with all their goods. Paul exhorts the church at Corinth about grumbling and complaining. He reminds the believers of the judgments that befell the 10 spies who brought a bad report of the land – and were struck down by a plague, and terrible fate of Korah and those aligned with him that came against Moses and Aaron and were swallowed up by the ground under them. How easy is it to fall into grumbling and complaining? It reminds me of an old muppets skit with two old men, Waldorf and Statler. Statler: Ah, it was great! Waldorf: Well, it was pretty good. Waldorf: Uh, there were parts of it that weren't very good though. Statler: It could have been a lot better. Waldorf: I didn't really like it. Statler: It was pretty terrible. It didn't take long for these two to turn something that was good into something they could complain about. It's especially easy for us to fall into this type of behavior – especially during this political season! However, our calling is to exhort, uplift and bring encouragement to the world! So let's not descend into murmuring or complaining – it did not go well for any who did. Continue to Lift Your Brother Up! Stand in Faith, Receive your Inheritance! Beware of the Silent Killer! Learn a Lesson From History!